Deficiency of spleen and kidney yang causing water retention, urinary difficulty or watery diarrhea. Heavy limbs, swollen joints or heavy abdominal distension with pain. 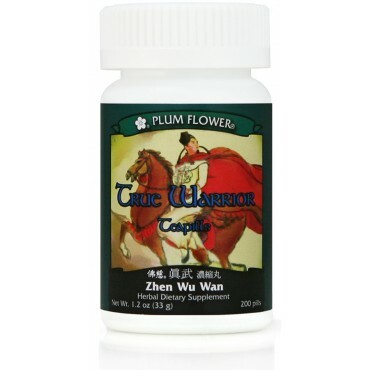 Edema, congestive heart failure, chronic nephritis, liver cirrhosis, ascites, hypothyroidism and arthritis. Dizziness and vertigo due to retention of dampness are some of the imbalances satisfied clients have used this product for. Tonifies and Warms Spleen and Kidney Yang, Eliminates Damp, Promotes Urination, Promotes Blood and Fluid Metabolism. Poria cocos fungus, Paeonia lactiflora root, Zingiber officinale rhizome-fresh, Aconitum carmichaeli root-prep, Atractylodes macrocephala rhizome. - Fu ling, Bai shao, Sheng jiang, Fu zi, Bai zhu. Contraindicated during pregnancy. Contraindicated for complaints due to Yin deficiency or excess heat.